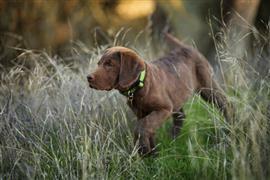 Chesapeake Bay Retriever names are often taken from their role as a gundog. They share many common names like Wrangler, Jake, and Hunter with other hunting breeds. No gundog name list is complete without the guns. Remington (Remi for short), Colt, Cooper, and Trigger are just a few names that fit this theme. One of the most defining characteristics of the Chesapeake Bay Retriever is a typically reddish brown coat. Many owners elect a red or brown color name that fits the appearance of their puppy. Cinnamon, Rose, and Crimson are good options for a dog with a more reddish coat. Hershey, Chewbacca, and Coco are great fits for brown or tan coats. The breed originated in the state of Maryland with two dogs named Sailor and Canton. Adopting one of these names or a name related to the state of Maryland is an excellent way to highlight your dog's history. A few ideas that match up with the breed's past are Raven (after the Baltimore Ravens), Annapolis or Anna (after the capital of Maryland), or Oriole (after the state bird and Major League Baseball team based in Baltimore). Some of our pages will contain a subcategory. A subcategory is a slightly more specific grouping than the main topic of the page. For a subcategory, we will include a separated table of names and corresponding descriptions. An example of a subcategory of Red Dog Names would be 'Dog Names Inspired by Red Wines'. If you have any subcategory ideas for the Chesapeake Bay Retriever Names page, we would love to hear them. Use the form below to submit your ideas.